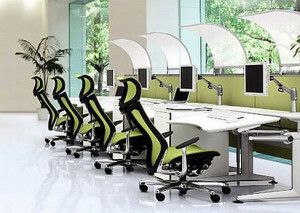 Ergonomic workstations can lead to better employee morale and higher productivity. On the other hand, ignoring ergonomics can result in long term problems. Good ergonomics starts with selecting and arranging office furniture. Consider the following tips when designing a workspace. Choose a chair that can be adjusted so that your legs are comfortable. Your feet should touch the ground rather than hanging in the air. A footstool can be used if your legs are too short for this. Make sure that your legs fit correctly under the desk. You should have space on all sides of your legs when you are seated at your desk. Some desks are adjustable, which can be very helpful in achieving sufficient space, especially for taller employees. Choose a chair with adjustable lumbar support. Sitting for long periods of time causes strain on the lower back. Lumbar support can lessen this. Adjustment is important to ensure you can receive the proper support for your body. The desk should allow you to set your computer monitor to eye level. This will help with head and neck strain. A monitor riser can be used if the monitor cannot be set up at the correct height on the desk. Set up your desk in a way that allows you to use things you need often without having to overextend your arms or body. Consider this when selecting a desk that will meet your needs. Taking the time to consider ergonomics when selecting and arranging office furniture will result in happier, more productive employees. For assistance with this, please contact us. The Office Planning Group will be happy to help you.